The Vietnam War was a Cold War-era military conflict which occurred in Vietnam, Laos, and Cambodia from 1 November 1955 to the fall of Saigon on 30 April 1975. It is sometimes referred to as the Second Indochina War. In Vietnam it is often referred to as the American War. It was fought between the communist Democratic Republic of Vietnam (North Vietnam) and its allies, and the US-backed Republic of Vietnam in the south. It ended with the defeat of South Vietnam in April 1975. The Viet Cong, a lightly armed South Vietnamese communist common front directed by the North, largely fought a guerrilla war against anti-communist forces in the region. 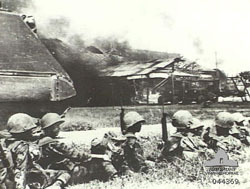 The Vietnam People's Army (North Vietnamese Army) engaged in a more conventional war, at times committing large units into battle. U.S. and South Vietnamese forces relied on air superiority and overwhelming firepower to conduct search and destroy operations, involving ground forces, artillery, and airstrikes. Photo at right shows the evacuation of a wounded Korean infantryman by American medical evacuation iroquois helicopter. 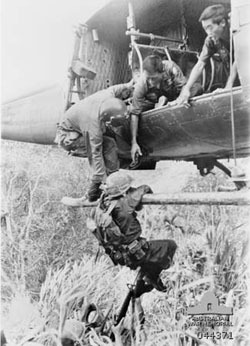 The U.S. government viewed involvement in the war as a way to prevent a communist takeover of South Vietnam as part of their wider strategy of containment. The North Vietnamese government and Viet Cong viewed the conflict as a colonial war, fought initially against France, backed by the U.S., and later against South Vietnam. American military advisors arrived in what was then French Indochina beginning in 1950. U.S. involvement escalated in the early 1960s, with troop levels tripling in 1961 and tripling again in 1962. U.S. combat units began being deployed in 1965. Operations covered international borders, with Laos and Cambodia heavily bombed. American involvement in the war peaked in 1968, at the time of the Tet Offensive. After this, U.S. ground forces were gradually withdrawn as part of a policy known as Vietnamization. Despite the Paris Peace Accords, signed by all parties in January 1973, fighting continued. By 1969, at the peak of U.S. involvement in the war, more than 500,000 U.S. military personnel were involved in the Vietnam conflict. Growing opposition to the war in the United States led to bitter divisions among Americans, both before and after President Richard Nixon ordered the withdrawal of U.S. forces in 1973. In 1975, communist forces seized control of Saigon, ending the Vietnam War, and the country was unified as the Socialist Republic of Vietnam the following year. U.S. military involvement ended on 15 August 1973 as a result of the Case--Church Amendment passed by the U.S. Congress. The capture of Saigon by the Vietnam People's Army in April 1975 marked the end of the war, and North and South Vietnam were reunified the following year. The war exacted a huge human cost in terms of fatalities. Estimates of the number of Vietnamese soldiers and civilians killed vary from 800,000to 3.1 million. Some 200,000--300,000 Cambodians, 20,000--200,000 Laotians, and 58,220 U.S. service members also died in the conflict. The Vietnam War was the longest and most unpopular conflict of the century for both Australia and New Zealand. The war was the cause of the greatest social and political dissent in Australia since the conscription referendums of the First World War. Many draft resisters, conscientious objectors, and protesters were fined or jailed, while some soldiers met a hostile reception on their return home. Photo at right shows South Vietnamese soldiers take a break following heavy fighting in the Tan Son Nhut area near Saigon airport. Five men that were killed were only 16 years old! The oldest man killed was 62 years old! The average fighter was only 22 years old!